The following is a guest contribution from Mary Shulzhenko. Mary is a digital marketer, content strategist and a copywriter. She is passionate about writing on customer service, customer experience, small business, marketing and a variety of other business topics. She provides the original content for LiveAgent, an award-winning and the most reviewed help desk software for SMBs in 2018. You can find her on LinkedIn. Would you agree to fly on a plane knowing that the crew was simply ‘told’ what to do but didn’t use clear guidelines and instructions? Probably not. Sadly, that is how many organizations operate today – without realizing that it may result in a wide range of negative consequences, from employee inefficiency, to lost customers and profits. Telling employees what to do is not nearly as effective as having a set of written step-by-step instructions they can follow, explaining how exactly routine operations should be performed. That’s where standard operating procedures, or SOPs, come in. 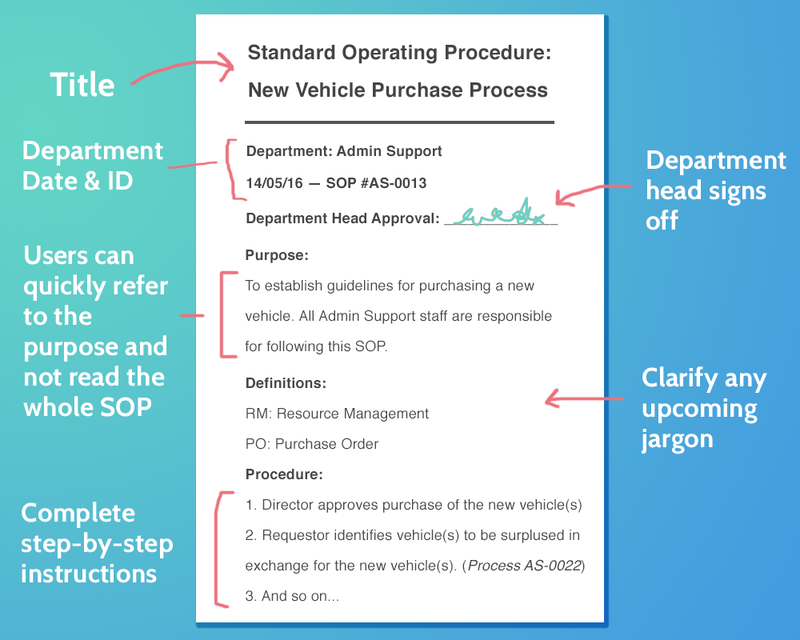 Not all standard operating procedures have to be this formal, but sticking to a standard format that suits your business makes SOPs easier to create and use. SOPs are aimed to increase employee productivity and performance, reduce miscommunication and eliminate errors, improve compliance with industry guidelines, and safeguard the quality of customer support. SOPs are what smart businesses use to scale, and create consistency in how processes and tasks are performed. No matter the size of your organization, establishing effective SOPs can make things easier for everyone involved – business owners, managers, customer service employees, and ultimately the customers. And while your clients may not ever see your SOPs in a written form, they will most likely be able to tell whether or not you have them in place by the way your business operates. Here are 7 major reasons to have clearly defined standard operating procedures and how they can help you improve your customer support. 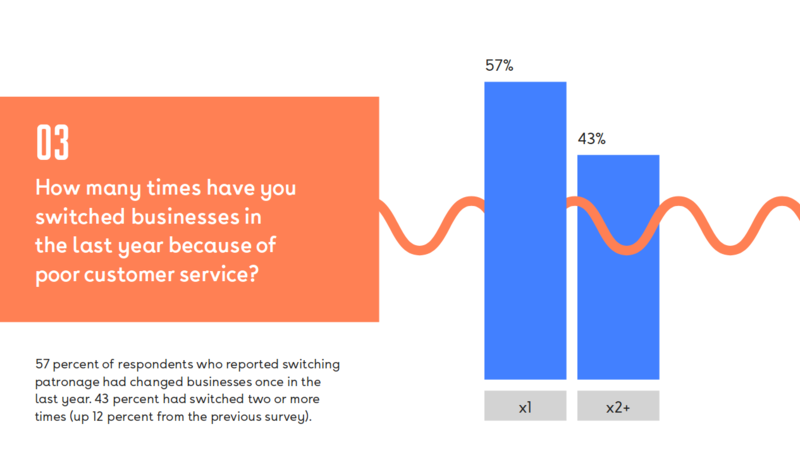 According to the recent NewVoiceMedia’s 2018 “Serial Switchers” report, poor customer service is costing businesses more than $75 billion a year (which is up $13 billion since its last report in 2016). What accounts for bad support? While there might be numerous factors affecting the service quality and customer satisfaction, one of the fundamental obstacles standing in the way of efficient communication between your customers and your service team is when the agents simply don’t know what to do, especially when things go wrong. Having well outlined service SOPs ensures that each member of your customer support team has a clear understanding of what is expected of them at every stage of the service journey, and know how to appropriately respond in any given situation. This could include answers to standard questions, clarity about the way a customer should be spoken to on the phone, via email or through live chat, instructions on how to handle common complaints and challenging service queries, and more. Today’s highly demanding consumers expect to receive efficient, effective and consistent customer service each and every time, which is proved by numerous researches. In fact, the State of the Connected Customer Report by Salesforce revealed that as much as 81% of consumers expect the same level of service every time they interact with a company across different channels, while 75% expect companies to provide consistent experiences wherever they engage, whether on a website, social media, mobile or in person. Are your service agents able to deliver that consistency? This is where standard operating procedures become invaluable. Well-structured and easily accessible SOPs will guide your customer support agents on how to effectively handle every service interaction on every support channel ensuring consistency with the level of customer care delivered by each employee of your support team. This is especially critical when it comes to dealing with complicated customer service issues that require non-standard solutions. Standard operating procedures allow you to train new customer support agents faster and more effectively. When SOPs are the foundation of training, new support employees don’t have to merely rely on what they heard and saw during the onboarding process. Instead, they learn that, when in doubt, they can always refer to the step-by-step guide to find the best way to handle each situation and reduce the chances of mistakes. The ThinkJar survey found that 84% of customers are frustrated when the service agent does not have information. It also revealed that 13% tell 15 or more people if they’re unhappy. SOPs empower new service agents to become more knowledgeable in a shorter amount of time and ensure they know exactly how to respond in various customer service scenarios, even though they don’t have much experience yet. Did you know that according to the 2018 Customer Service Benchmark report by SuperOffice, only 20% of companies are able to answer questions in full on the first reply, while the average response time to handle a customer service request is over 12 hours? With proper SOPs in place you will have more competent employees who can effectively handle support requests, in the fastest time possible. When your support agents know exactly what to do, time isn’t wasted. Getting more work done, more efficiently, equals to increased performance and productivity, and eventually leads to improved customer satisfaction. SOPs allow you to manage customer support employee performance and recognize those who perform better. In fact, without documented SOPs that enforce structured reviews, evaluating job performance often becomes a matter of opinion. With SOPs managers and team leaders can easily and clearly measure success of their support agents and identify where they need to improve their skills and knowledge in order to increase employee performance. Successful customer support is heavily influenced by confidence – it’s one of the most important components of delivering great service. In fact, confidence is closely tied to competence. Incompetent service agents who are not able to resolve an issue quickly, effectively and during a single interaction become the main source of frustration for customers. A Zendesk survey actually revealed that 72% of customers blame poor customer service for having to explain their issue multiple times. 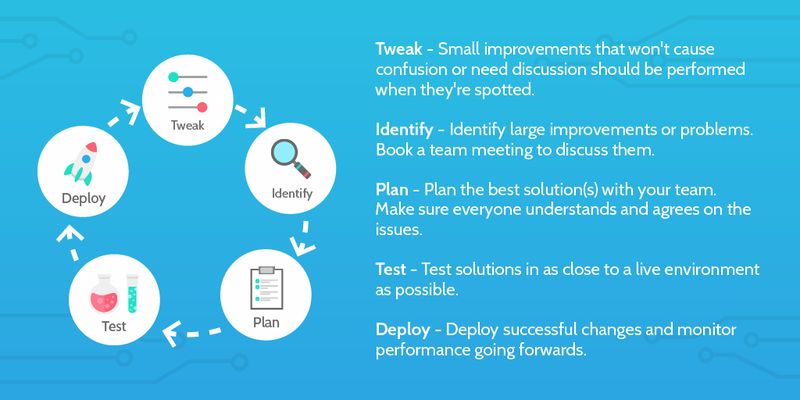 Well-designed SOPs create a great foundation of competence for your customer support employees serving as a roadmap for how to effectively resolve customer queries, from simple to the most complicated ones. This translates into improved employee confidence. A service agent who knows what to do and how to do it efficiently will definitely be more confident and will bring that confidence into each customer service interaction, which will further result in increased customer satisfaction. When it comes to managing a customer service team, one common challenge leaders face is when a key team member resigns, goes on leave or simply needs to be away from the office for a certain period of time. No matter what happens within your support department, your customers still demand consistently great experience, otherwise they will take their business elsewhere. A recent PwC survey claims that almost one in three consumers (32%) are ready to leave the brand they love after just one bad customer experience. In cases of an extended employee absence, written SOPs make it easier for managers to delegate responsibilities to another support team members. By referring to the SOPs manual, not only another employee will be able to easily take over the urgent tasks of an absent colleague, but most importantly, they will have a clear understanding of performing those tasks correctly. That ensures business continuity and allows to deliver a seamless customer service experience. Achieving excellent customer service is a continuous process of learning and improving that never stops. A survey conducted by ThinkJar discovered that 66% of consumers who switched brands did so because of poor service, while 85% of customer churn due to poor service was actually preventable. When your business operates based on standard operating procedures, they not only ensure consistency of your support quality, but also allow to identify opportunities for improving your internal processes and preventing mistakes, which could further help to improve your customer service experience. In fact, SOPs can be a very powerful tool for evaluating your current customer service practices and deciding how to move forward. Ideally, your service SOPs should be reviewed at least every six months to determine if something needs to be changed in the way your customer service is handled. In addition, the SOPs should be audited when same errors happen in order to prevent their recurrence. 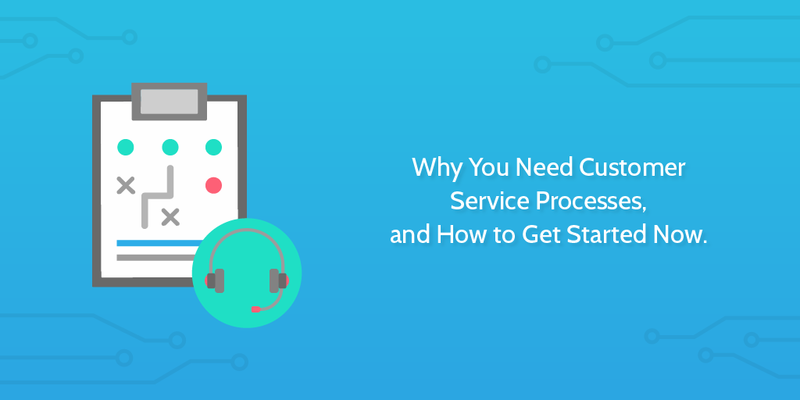 Now that you know why your business needs to have well-established standard operating procedures and how they can impact your customer support quality, you are probably wondering what to start with. As a matter of fact, developing effective SOPs requires thorough preparation before you can even begin composing the document. While you may have a good general understanding of what the process consists of, chances are you don’t know all the small but very important details that can affect the outcome. To get the procedure described correctly, talk to your customer support employees who actually perform it on a daily basis. Allowing them to be part of the process will also make them feel more personally invested in the company’s performance and success. Decide on the right format for the SOPs document and write down the exact tasks and how they need to be completed for the process to be successful. Whether it’s a checklist, a step-by-step guide or a workflow diagram, make your writing concise, easy to read and understand for everyone involved. To be user-friendly SOPs should be clear, unambiguous and written in a plain language, while also keeping a positive tone. Poorly-written SOPs are a source of misinformation. Once the first draft is created, have someone test the procedure performing each step exactly as described. Make sure the instructions are logical, easy to follow, provide only relevant information and actually facilitate in completing a certain task. It will also be very helpful to test the procedure on someone who has never done it before and therefore cannot rely on their knowledge and previous experience. If needed, make the necessary changes and improvements. Make the SOPs document easily accessible to all the members of your customer support department, so that they can refer to it whenever they need. Then, ensure all your current support employees are properly trained to follow the SOPs. The document will also be a great tool for quick and efficient onboarding and training of new agents who will join your customer support team in future. Once the SOPs manual is created, it should be thought of as a living document that needs to be review, improved and updated on a regular basis to remain relevant and useful. Your customer support employees should feel comfortable making updates and adjustments to the SOPs based on the changing needs of the company and customers’ demands. After all, their own productivity, performance and efficiency relies on it. With detailed SOPs available, your support agents will have a clear understanding of how to effectively handle common and uncommon support inquiries to ensure that a fast, efficient and consistently great service is delivered in each and every interaction, to each and every customer. But processes can be time-consuming to create from scratch. Let me know in the comments – does your company have standard operating procedures in place? If not, what stops you from establishing them?